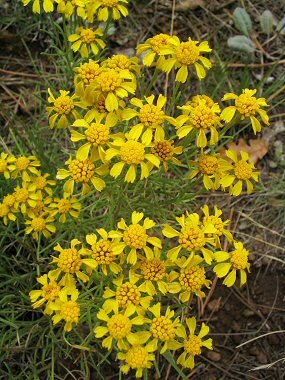 Broom Groundsel is a bushy plant and member of the Sunflower Family. It grows to 2 feet in height and has dark green, narrow leaves to 3 inches in length which grow all along the stem. The plant typically grows in clearings in pine forests at elevations between 6500-9000 feet. Other names for the Broom Groundsel are the Grass-leaved Ragwort and Broom Senecio. Broom Groundsel typically blooms between July - October and produces yellow flowers with 8 drooping petals, each of which has 2 notches in the end to 0.75 inches in width.